Whether you’re born and bred in Glasgow or someone who's just passing through, you'll know the city really does boast some of the best nightlife in the world. But if you're a bit bored of regular run-of-the-mill events and club nights then don't to worry because Glasgow has you covered. From ping pong enthusiasts to Taylor Swift fanatics there's something catering to all tastes - here’s a guide to some of the more unusual weekly and monthly club nights and events in and around Glasgow. If you fancy yourself at ping pong and want a chance to win Hillhead Bookclub’s coveted Golden Paddle, Ping! is your night. Head over to the venue on a Monday night for your chance to show off your dexterity and skills. HB also runs various events during the week including Say It Ain’t Sew on a Tuesday night for those who like their stitching to come with a cocktail or two. Ping!, Mondays 8pm, Hillhead Bookclub, 17 Vinicombe Street. Think you’re the next Van Gogh? Then All the Young Nudes might be for you. Every Tuesday, The Flying Duck flings open its doors for this weekly drawing club. Three life models pose for varying lengths of time throughout the night. The session breaks around 9pm for a drink, music and some banter. Drawing skills aren’t necessary to take part. Tickets are £5 and available in advance if you want to bag a good seat prior to start. All the Young Nudes, Tuesdays 8pm-10pm, The Flying Duck, 142 Renfield Street. Kick your Friday night off in traditional Scottish style with Sloans' weekly ceilidh night. With music by Chitterybite, there’s plenty of space in Sloans Grand Ballroom for stripping the willow. A caller will also be there to instruct those less sure of their Gay Gordons from their Dashing White Sergeants. Tickets are £10 or £8 for students or larger groups. You can also make a proper night of it and throw a two-course meal in for £29.95. Sloans' Friday Night Ceilidh, Fridays, Sloans, 62 Argyll Arcade. Open since 2012, Wild Cabaret is a unique balance of good food, well-crafted drinks and fantastic entertainment. They run a range of regular nights, from their Wednesday Kitsch Kabaret evening (encompassing dancing, magic and more) to their regular Friday/Saturday event The Big Show. Advance booking is advised. Wild Cabaret and Wicked Lounge, 18 Candleriggs. Every Friday and Saturday night Swing opens its doors to the public and combines a dazzling blend of live jazz, blues, soul and funk with aerial acrobatics, dancers and performance acts. With stunning décor added to the mix, Swing is a night which has to be seen to be believed. £7 entry on door or £10 in advance for reserved seating. Swing, Fridays and Saturdays 7pm-3am, 183a Hope Street. Perhaps you love karaoke but aren’t such a big fan of waiting for your moment in the spotlight. Don't worry, Hummingbird has you covered. There's a number of rooms available to book that will cater to your karaoke, foodie or party needs. The Glitter Room will squeeze up to 15 of your closest friends in, whilst the Posh Room will hold up to 40. It’s a great space for a private event or just a bit of fun away from the main bar. Did we mention there’s a dressing up box thrown in for good measure too? Prices vary. Shout Bamalama is Glasgow’s longest running vintage club night, bringing 50s and 60s Soul, R&B and rock‘n’roll right to the forefront. It's held on the first Saturday of every month. Open from 11pm until 3am, tickets are cheap and cheerful (£3/£5 after midnight) with the dancefloor always filling up fast. Definitely one for your dancing shoes. Shout Bamalama, first Saturday of the month 11pm-3am, Blackfriars, 45 Albion Street. Despite the fact it’s been running since 2005, Pretty Ugly Club is one of Glasgow’s best kept secrets. Not anymore. Keep the second Saturday of every month free and head down to this gem of a night. With everything up for request, from Taylor Swift to TLC, it really is the best in retro electro and poptastic indie disco. Tickets are £6 or £5 before 12pm/students. Pretty Ugly Club, second Saturday of the month 11pm-3am,The Admiral Bar, 72a Waterloo Street. &amp;amp;amp;amp;amp;amp;lt;img class="photo lazy inline" src="//media.timeout.com/images/102413701/image.jpg" loaded="125252" total="125252" type="image/jpeg" data-width-class="50"
Now onto its ninth event in Glasgow, the principle of Songs Ya Bass is simple: it's a club night for people who love to boogie but don’t get the chance to anymore. Early doors (7pm–11pm) mean if you have kids or prefer your dancing before midnight, this one’s for you. Oh, and you also get to pick the playlist with song requests taken from the hosts right up until it kicks off. The next one takes place on Saturday May 16. Get your choons at the ready! Songs Ya Bass, Saturday May 16, The Buff Club, 142 Bath Lane. 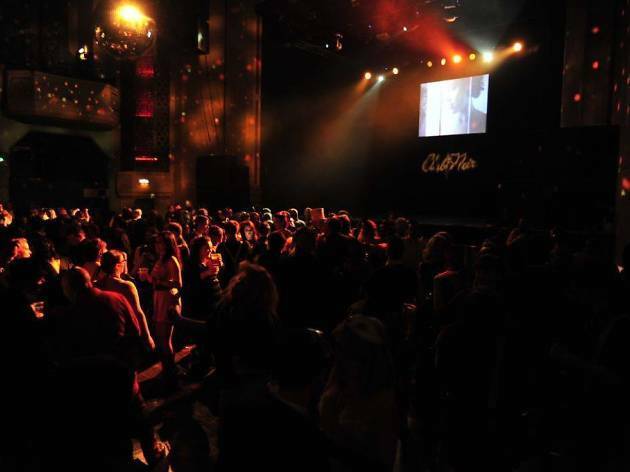 &amp;amp;amp;amp;amp;amp;lt;img class="photo lazy inline" src="//media.timeout.com/images/102413809/image.jpg" loaded="50535" total="50535" type="image/jpeg" data-width-class="50"
The biggest Burlesque club in the world (that’s a fact), Club Noir is a must if you prefer your nights out to be big, bold and with a dress code to impress. The playlist encompasses everything from vintage sounds to modern dance, with DJ Loveless usually presiding over it all. Their next big event is Summer in the 60s, taking place Saturday August 1, so there’s plenty of time to get your glad rags on. Music comes from French 60s band Les Bof. Tickets are £15.50 and usually sell-out ahead of the big night, so buy them early to avoid disappointment. Club Noir, O2 Academy, 121 Eglinton Street. See more music and nightlife in Glasgow from Time Out.